The SnowCheck-Exclusive 850 PRO-RMK® 163 - powered by the all-new Polaris® 850 Patriot™ engine - offers the best power-to-weight ratio. POWDERTRAC® RUNNING BOARDS - 600 AND 800 MODELS: The PowderTrac® Running Boards have been developed for maximum snow clean out and maximum strength. Built from extruded aluminum with bonded cast lugs, they boast an open area of over 50% and integrated traction that is machined in for sure footed performance. There is now additional open space at the back of the boards by the rear pad to reduce snow build up. POWDERTRAC® XT RUNNING BOARDS - 850 MODELS: The lightweight PowderTrac® XT Running Boards were developed for extreme riders with new geometry for improved sidehilling and deep snow capabilities. The improved ergonomics maintain usable space for the rider and traction at the rear of the boards. LIGHTWEIGHT: Polaris® snowmobiles are the lightest sleds on the mountain. They have always been light and rigid with added strength and durability while reducing weight on the RMK® AXYS® platform. Providing riders with instantaneous lift, Polaris sleds help riders get up on top of the snow faster. AXYS® CHASSIS: The raised AXYS® chassis increase clearance and reduces drag to keep you on top of the snow. It is purpose-built for mountain riding and allows for improved sidehilling, faster and easier climbing, and instantaneous lift allowing the sled to pop onto the snow faster. The aluminum over structure is lightweight and durable for all types of riding. Taller spindles increase clearance to reduce drag. LIBERTY® ENGINE CHOICES FOR EVERY RIDER: Built to integrate seamlessly with the lightweight and agile Polaris® chassis, Liberty® engines feature class-leading power-to-weight ratios and set a new benchmark for ultimate performance with our complete line-up of powerful options. REAR SUSPENSION: The lightweight, rigid rear suspension design features revised geometry to control pitch. This improves weight transfer, delivering better control and a more compliant ride. The rigid suspension delivers power directly to the snow. Off-trail, riders will notice improved weight transfer while maintaining the approach angle. On-trail, riders will notice a more compliant and comfortable ride. The rear suspension features a rail design that helps lift the rear skid while driving it forward. WALKER EVANS® SHOCKS: The PRO-RMK® 163 comes with premium Walker Evans® Piggyback Shocks or Monotube Shocks. The Walker Evans® Piggyback Shocks with compression adjusters and remote reservoirs offer the best performance across the broadest range of conditions. The Walker Evans® Monotube Impact-Extruded Shocks are the lightest weight shock option from Polaris® for those riders counting the ounces. The one-piece, simple design is lightweight yet durable. QUICKDRIVE® LOW INERTIA DRIVE SYSTEM: The QuickDrive® System is designed to make the sled rev quicker for instantaneous lift and reduces rotational inertia by 21% for easier handling and flickability. Not simply a belt-drive, it's a complete lightweight drive system. 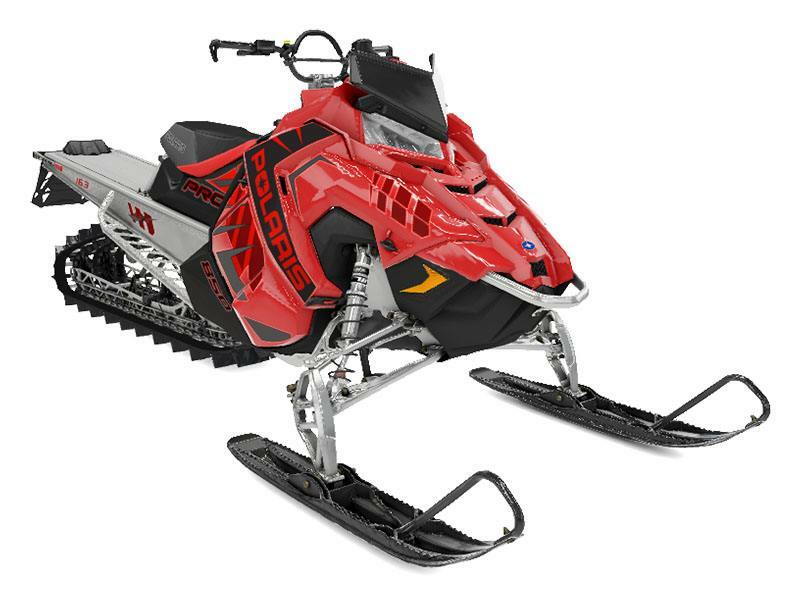 AXYS® BODY PANEL DESIGN: The AXYS® PRO-RMK® features a compact body panel geometry and design that help give the sled the best lean angle in the industry allowing it to hold even the steepest sidehill lines. The PRO-RMK® does not "panel out" like other sled brands. PRO-RMK® REACT SUSPENSION™: The PRO-RMK® React Suspension™ provides riders with the most precise and effortless ride in the deep snow. Effortlessly initiate sidehills and experience less fatigue with the most predictable ride. It includes a 36"-38" stance, a sway bar designed for predictable handling, and forged a-arms and spindles optimized for strength and durability.